Collating sorts multiple copies into their proper order. For example, when making 4 copies of a 4-page document, collating keeps each 4-page document sorted instead of printing multiple copies of the first page first. Cropping is an option in most image editing software, and involved cutting away less important parts of the image so that the most important parts can be printed larger on the page. Printing in “Draft Mode” uses less ink or toner, and also prints more quickly. It is a great way to preview a page or two to check the formatting before printing a large document. It is also one of the best ways to reduce printing costs. Duplexing involves printing on both sides of a page. While this isn’t supported by all printers, enabling this feature on supported models can reduce paper costs by as much as 50%, and opens up more options for customized output. Color inkjet printers often use “composite black” which combines each of the color inks to make black. Printing in grayscale mode ensures that the printer is only using black ink, which is generally much less expensive to replace. Laser printers often use the term “monochrome” instead. The margin is the unprinted area around your image or text. If you find that the margins are often too big or too small, change the setting in your word processor or image editing program. This option allows you to choose between portrait (vertical) or landscape (horizontal) orientation. Landscape is often useful for printing signs or wide images, while portrait is most common for text. Click between the two options to see a preview of the output in order to choose the best option. The resolution is measured in dots per inch (DPI) and controls the quality level of the output. 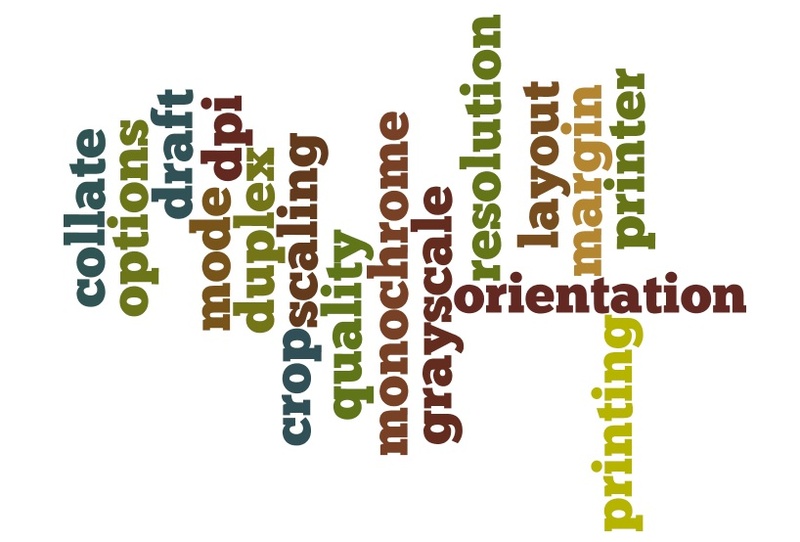 For some printers, these settings may simply be labeled “High Quality”, “Fast”, “Draft”, etc. The lowest quality settings generally use less ink or toner, and are usually the fastest, but the quality is reduced. This option allows you to print your image or text larger or smaller on the page. Setting it too high may result in some of the material being printed on a second page, while setting it too low could mean wasted space. Choosing 100% or the “Fit to Page” option is often the best. Experiment with different choices and view the preview box to see what affect it will have. By understanding the terms listed here, you will have a better idea of how the major printing options may apply to your project. By utilizing options such as duplexing and quality settings, you can actually save money on supplies, and options like orientation and cropping can help you produce better images and text.